Dental infection has plagued the human kind for as long as our species has existed. When dental infection spreads deeply into the soft tissue rather than exiting superficially through oral or cutaneous routes, fascial spaces may be affected. Following the path of least resistance through connective tissue and along fascial planes, infections may spread quite distantly from its dental source, causing considerable morbidity and mortality. It is often difficult to diagnose the stage of infection and to define its exact anatomic location based on clinical and conventional radiographic examination alone. In patients with acute odontogenic infections, it is often difficult to clinically determine, whether there is an abscess which requires surgical intervention or cellulitis that can be managed satisfactorily with antimicrobial therapy and supportive care alone. Finding of fluctuance is often difficult on clinical examination, especially in spaces such as the submasseteric, where purulent material is deep within the soft tissues and muscle. The relative blind surgical incision and drainage performed in such situations usually results in excessive harm through unnecessary extensive incisions, and failure to locate and evacuate the abscess cavity completely. Radiographs and other imaging studies can be used to diagnose the spreading infections in the head and neck. However, plain radiographs do not often provide good definition of soft tissue. Both CT and MRI are expensive, time consuming and not easily available. Hence, we need adjunctive diagnostic aids to correctly identify the stage of infections and to provide appropriate management. Ultrasonography (USG) has played a major role as a diagnostic tool in various medical conditions. The sonographic images are identified in terms of echoes as hypoechoic, hyperechoic and anechoic images. The potential use of ultrasonography in fascial space infections of odontogenic origin has not been explored completely and deserves much more intensive, high-quality research. The study sample comprised of 30 subjects, presenting to the Department of Oral Medicine and Radiology, J.S.S. Dental College and Hospital, JSS University, Mysore, with fascial space infections of odontogenic origin, satisfying the following inclusion and exclusion criteria and those willing to participate in the study were selected by purposive sampling. Subjects of either gender, irrespective of age, presenting with unilateral fascial space infections of odontogenic origin. Individuals who required immediate emergency management. Individuals with bilateral involvement of fascial spaces. Ethical clearance was obtained from the Institutional Ethical review board prior to conducting the study. The selected subjects were explained in detail about the procedures involved and a written informed consent was obtained from them. The selected patients were made to sit comfortably on the physiological dental chair with artificial illumination. Relevant history was noted down on a specially designed proforma. A detailed extraoral and intraoral clinical examination was carried out by adopting the methods of Kerr, Ash and Millard  and relevant findings ascertaining the nature of fascial space infection, and its origin, were noted on the individual proforma. The subjects were then transferred to the radiology section for radiographic examinations either intraoral periapical (IOPA) or panoramic radiographs as deemed necessary on a case to case basis to confirm the clinical findings. Both IOPA and panoramic radiographic examinations were carried out adopting the methods of White and Pharoah. After evaluating the clinical and radiographic findings, a working diagnosis was made and noted down in the individual proforma. Edematous changes: The echogenicities of the tissues were isoechoic, similar to the normal or uninfected side but with an increase in the fluid contents. Cellulitis: The echogenicities of the tissues were higher (hyperechoic) than normal because of massive inflammatory infiltration to the infected region. Preabscess stage: The echogenicities of the tissues were mixed (hypoechoic and hyperechoic) at the end of cellulitis stage and the beginning of abscess formation stage. Abscess stage: The echogenicities of the tissues were absent (anechoic) because of the abscess cavity, which can be solitary or multiple well-defined foci of pus. The USG images were interpreted by the operator (Sonologist) on the monitor and the USG diagnosis was obtained. After the USG examination, the USG-guided intraoperative aspiration was undertaken in all cases under aseptic conditions. A high-resolution ultrasound scan was performed using a 5.7 linear array probe in direct contact with skin surface using sterile ultrasound gel as the coupling agent. The patient was in the supine position with the head tilted toward the unaffected side. After visualizing the abscess cavity under the guidance of the ultrasound, the probe position was adjusted so that the intended puncture point of the abscess was aligned with the imaginary midline of the probe and distance from skin surface to the required depth of the needle insertion was measured accurately. A 20-gauge needle mounted on sterile 10 ml disposable plastic syringe was inserted freehand at an angle perpendicular to the scanning plane. During the procedure the patient was instructed not to move, breathe deeply, or swallow during the needle insertion to avoid the shifting of the image. The needle was withdrawn and the site was covered with a temporary dressing. The aspirate collected was sent for microbiological culture sensitivity tests. The USG-guided intraoperative aspiration findings served as the gold standard for the definitive diagnosis. The data thus obtained was subjected to statistical analysis using SPSS version 16.0 for Windows. The statistical methods used in this study were as follow. Among the 30 study subjects included in the study, 12 (40%) were males and 18 (60%) were females. The males ranged in age from 9 to 58 years with a mean age of 31.5 years. The females ranged in age from 6 to 59 years with a mean age of 29.9 years. Of the 43 involved spaces, submandibular space was the most commonly involved space (15, spaces 34.8%). 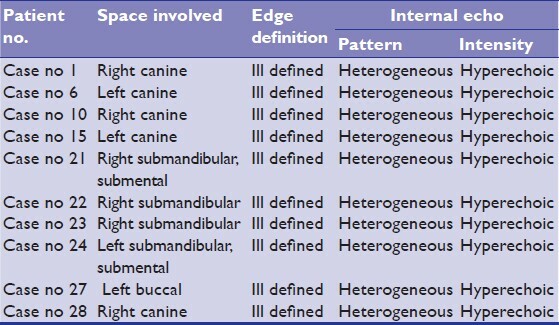 The second most commonly involved space was the buccal space (10, 23.2%) and the third was the canine space (8, 18.6%), they were followed by submental (7, 16.2%) and submasseteric space (3, 6.9%) [Table 1]. Single space involvement was noted in 17 (56.7%) cases and multiple spaces were involved in 13 (43.3%) cases. According to the findings of ultrasonography, out of the 30 cases 6 (20%) were in edema stage, 10 (33.3%) in cellulitis and 14 (46.7%) cases were noted to be in abscess stage. In all the abscess cases USG showed well-defined edge definition expect in 2 (14.3%) cases where the edge was not clearly defined. 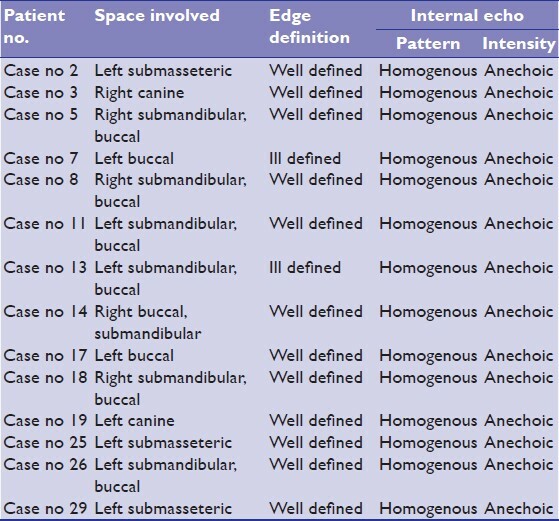 The internal echo pattern was homogenous and anechoic in all of the abscess cases [Table 2], [Figure 1]. USG findings in cases of cellulitis showed an ill-defined edge definition with a heterogeneous hyperechoic internal echo pattern. In six edema cases USG showed an ill-defined edge definition and heterogeneous and isoechoic internal echo pattern [Table 3] and [Table 4], [Figure 2] and [Figure 3]. Out of the 30 cases of fascial space infections, 7 (23.3%) cases were involving the deciduous dentition. Lower second deciduous molar was the most commonly involved tooth. In the permanent dentition lower second and third molars were the most commonly involved teeth. Of the 30 subjects, a clinical working diagnosis of abscess and cellulitis was rendered in 17 (56.7%) and 13 (43.3%) cases, respectively. On USG-guided intra operative aspiration of the fascial space infections of all 30 subjects, 14 (46.7) cases were found to be abscess and 16 (53.3%) were found to be cellulitis. On comparing the results of clinical working diagnosis with USG-guided intra operative aspiration, a positive correlation was found in 11 (64.7%) of the 17 cases with a clinical working diagnosis of abscess. Six (35.5%) cases with a clinical working diagnosis of abscess were diagnosed as cellulitis on USG-guided intraoperative aspiration. On comparing the results of clinical working diagnosis with USG-guided intraoperative aspiration, a positive correlation was found in 10 (76.9%) of the 13 cellulitis cases. Three (23.1%) cases with clinical working diagnosis of cellulitis were found to be abscess on USG-guided intra operative aspiration. The overall co-relation of results between clinical working diagnosis and USG-guided intraoperative aspiration was found to be significant, with a P value of 0.03. The overall sensitivity of diagnosing abscess and cellulitis cases by clinical and radiographic examination alone (i.e. clinical working diagnosis) was found to be 78.5% with a specificity of 62.5%. A positive predictive value of 64.7% and negative predictive value of 76.9% was obtained [Table 5]. Of the 30 subjects, an USG diagnosis of abscess and cellulitis was rendered in 14 (46.7%) cases and 16 (53.3%) cases, respectively. On comparing the results of USG diagnosis with USG-guided intraoperative aspiration, a positive correlation was found in all 14 abscess cases and all 16 cellulitis cases. The overall co-relation of results between USG diagnosis and USG-guided intra operative aspiration was found to be very highly significant, with a P value of 0.0001. USG showed a sensitivity and specificity of 100% for diagnosing the cases of fascial space infection of odontogenic origin [Table 6]. On comparing the results of clinical working diagnosis with USG diagnosis, a positive correlation was found in 11 (64.7%) of the 17 abscess cases. Six (35.5%) cases with a clinical working diagnosis of abscess were diagnosed as cellulitis on ultrasonography. On comparing the results of clinical working diagnosis with USG, a positive correlation was found in 10 (76.9%) of the 13 cellulitis cases. Three (23.1%) cases with clinical working diagnosis of cellulitis were found to be abscess on USG. The overall co-relation of results between clinical working diagnosis and USG diagnosis was found to be significant, with a P value of 0.03 [Table 7]. Such results emphasize the role of good clinical and radiographic acumen in the diagnosis of fascial space infections of odontogenic origin. In the present study, USG was correctly able to diagnose all the cases of abscess, i.e. 14 (46.7%) cases as were diagnosed with USG-guided intraoperative aspiration. Similarly, all 16 (53.3%) cases of cellulitis were correctly diagnosed with USG. 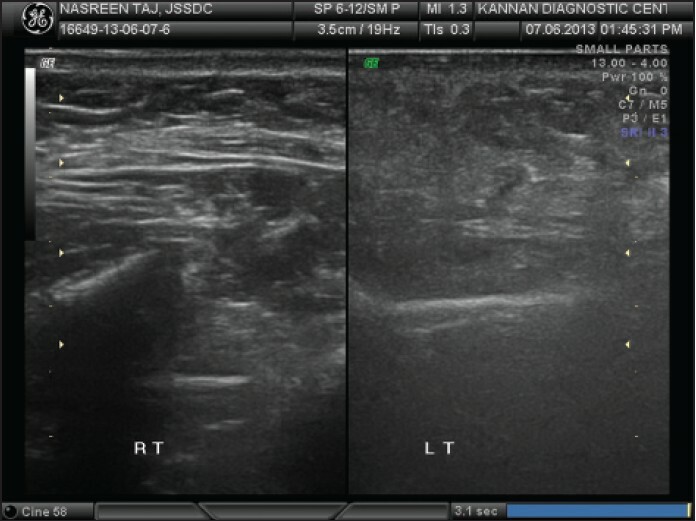 This shows sensitivity and specificity of 100% for diagnosing both abscess and cellulitis cases by ultrasonography. Since, in the present study all study subjects had superficial fascial space infections; all were accurately diagnosed when correlated with the USG-guided intraoperative aspiration which was considered as the "gold standard". During the USG evaluation of the subjects the fascial space infections were graded according to the description given by Bassiony et al.,  and it was found that out of 30 cases 6(20%) were in the edema stage, 10 (33.3%) were in the cellulitis stage and 14 (46.7%) were in the abscess stage. Ultrasonographic staging was not included during the statistical analysis because it is not clear in the literature what is expected to be found in the other stages upon surgical intervention. For example, is pus expected to be found in the preabscess stage since it is considered to be between the cellulitis and abscess stages? The diagnoses were made based upon whether the operator and expert believed the swellings were mainly in the cellulitis or abscess stage (i.e. whether the purulence was expressed upon intra operative aspiration or not). Making a clear cut diagnosis or knowing the stage of the swelling is important if the treatment of the swellings is different. But for cases with either cellulitis or edema the treatment rendered will be the same. The echogenicities of the tissues in the edematous phase were isoechoic, similar to the normal or uninfected side but with an increase in the fluid content and with increased thickness of skin and subcutaneous tissues [Figure 3]. The conclusions drawn from the study are as follows. USG displays utmost accuracy in the diagnosis of fascial space infections of odontogenic origin. USG can be used as a reliable adjunctive imaging technique in the diagnosis of fascial space infection of odontogenic origin and thus aids in appropriate treatment planning and management of such cases. 1. Topazian R, Moton H, Goldberg M, Hupp JR. Oral and Maxillofacial infections. 4 th ed. USA: W.B Saunders company; 2002. p.168-84. 2. Peleg M, Heyman Z, Ardekian L, Taicher S. The use of ultrasonography as a diagnostic tool for superficial facial space infections. J Oral Maxillofac Surg 1998;56:1129-31. 3. Baurmash HD. Ultrasonography in the diagnosis and treatment of facial abscesses. J Oral Maxillofac Surg 1999;57:635-6. 5. White SC, Pharoach MJ. "Oral Radiology Principles and interpretation". 4 th Ed. USA: Mosby An Affiliate of Elsevier Science. St. Louis; 2000. 6. 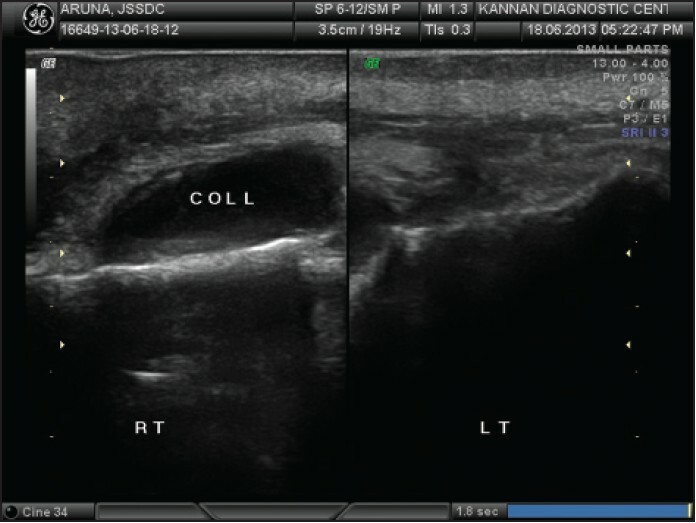 Bassiony M, Yang J, Abdel-Monem T, Elmogy S, Elnagdy M. Exploration of ultrasonography in assessment of fascial space spread of odontogenic infections. Oral Surg Oral Med Oral Pathol Oral Radiol Endod 2009;107:861-9. 7. Cachovan G, Phark JH, Schon G, Pohlenz P, Platzer U. Odontogenic infections: An 8 year epidemiologic analysis in a dental emergency outpatient care unit. Acta Odontol Scan 2013;71:518-24. 8. Rega AJ, Aziz SR, Ziccardi VB. Microbiology and antibiotic sensitivity of head and neck space Infections of odontogenic origin. J Oral Maxillofac Surg 2006;64:1377-80. 9. Bridgeman A, Wiesenfeld D, Hellyar A, Sheldon W. Major Maxillofacial infections. An evaluation of 107 cases. Aust Dent J 1995;40:281-4. 10. Labriola DJ, Mascaro J, Alpert B. The microbiologic flora of orofacial abscesses. J Oral and Maxillofac Surg 1983;41:711-4. 11. Mukhi PU, Mahindra UR. 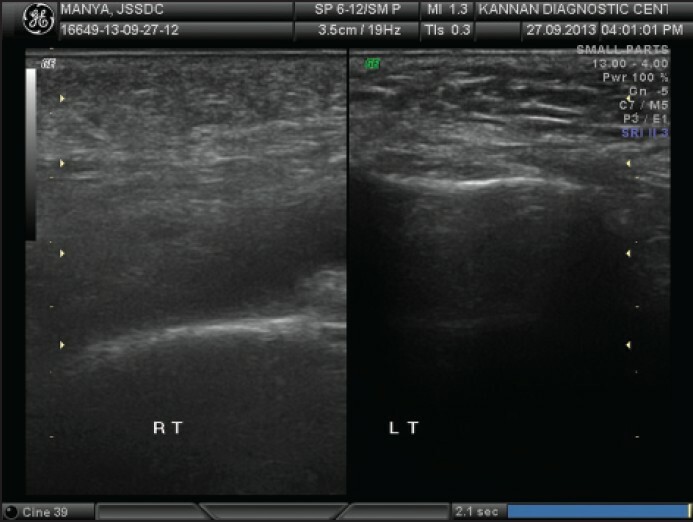 The use of ultrasonography in diagnosis and management of superficial fascial space infections. Indian J Dent Res 2012;23:313-9. 12. Aarthi Nisha V, Parthiban J, Santana N, Giridhar AG, Yashoda Devi BK, Sujatha Reddy S, Rakesh N, et al. Role of Color Doppler Ultrasonography in Diagnosis of Fascial Space Infections - A Study. J Clin Diagn Res 2013;7:962-7. 13. Jai Sanghar, S Ramasamy, J Sankar, Ravi David Austin, et al. Efficacy of ultrasonography in the diagnosis of inflammatory swelling of odontogenic origin. JIAOMR 2012;24: 98-101. 14. Suprakash B, Chakravarthi S, Vivekanand K, Krishna Prasad L, et al. Ultrasound as first line diagnostic tool in management of acute odontogenic infection of fascial spaces. J Orofac Sci 2010;2:9-13. 15. Siegert R. Ultrasonography of inflammatory soft tissue swellings of head and neck. J Oral Maxillofac Surg 1987;45:842-6.